My husband (Photofocus contributor Steve Eilenberg) frequently chides me for not editing tightly enough, of hanging on to image files that I “will never use and never show”. There is some truth to this. I have no problem doing the first pass, throwing out clear mistakes and duplicates. After that, it gets a LOT tougher. Part of the problem is some files are building blocks for a future image and I can’t know what their full potential is until I play around with them and process them. Earlier this summer, we went to a nearby beach in the afternoon to shoot. Because it was a grey and cloudy day during San Diego’s annual “June gloom”, we could shoot in the middle of the afternoon without harsh shadows. I had a new tool I needed to become familiar with, a Breakthrough Filters 6-stop neutral density (ND) filter. Slowing down the exposure and smoothing the ocean would highlight an interesting rock formation at the beach. The exposure would be long enough that surfers in the water would be blurred out. My parameters: ISO 200, f16, 1-second exposure. The exposure is long enough that surfers in the water are hinted at, but blurred, but not long enough to completely efface them. I quickly discovered 6-stops wasn’t enough. Luckily, Steve was shooting nearby and loaned me his to use in addition. Mine is circular, 77 mm and screws onto the front of a lens. In this case, I was shooting with the Fujifilm X-T2, paired with XF 16 mm F1.4 WR lens. His Nisi 3-stop ND filter is a huge rectangular filter, which I had to hand-hold in front of my 6-stop filter. My parameters: ISO 200, f16, 30-second exposure. Same composition as above, unadjusted, with the addition of 9 stops of neutral density, the shutter speed slowed to 30 seconds. The ocean has been tamed smooth and the surfers effaced, but the sand striations are less pronounced. Same parameters, ISO 200, f16, 30-second exposure. The inclusion of more foreground with the vertical positioning makes the sand striations in the foreground more of a feature. Those Nisi filters may be big, but they are designed to be used with a holder and not to be hand-held, however gingerly, by the edges. A square crop tightened the composition, focusing on the attractive S-curve in the center. I liked the leading lines formed by the striations in the sand, the sinuous S-curve of the rock and sand interface and the moodiness of the sky. The color was pleasant if a little monastic and subdued. What if I turned this into a monochrome version? Using Silver Efex Pro 2, one can quickly try on a variety of black and white looks for an image. My final version, with which I was pleased, has a dreamy quality of shimmery sand fusing into a limpid ocean. 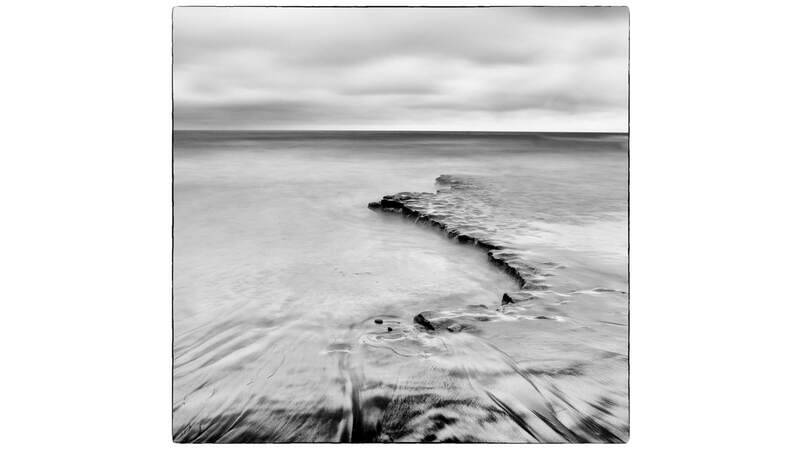 My final version, a shimmery black and white square crop emphasizes the silky smoothed water, with the sand striations flowing from foreground into the S-curve rock formation in the middle ground, leading to the defined horizon beyond and the moody, cloudy sky. Without processing the image to this point, it is hard to predict what is a keeper and what isn’t. So, I continue to hang on to files I may never use, or show, at least until I have given them a proper opportunity to shine.